I’m just going to jump right in there and say it: These sliders are out of this world! Not only are they beautiful to look at, but the flavors! Oh, the flavors! They are familiar but exciting and the combination is probably not one I would have ever come up with on my own. I was struck by the beauty of these vibrant purple sliders when flipping through my June edition of Olive magazine and was determined to recreate these in my own kitchen and share them with all of you. Even if you’re not vegetarian, these are super delicious and impressive enough to warrant a night without meat and they’re sure to impressive whomever you’ve got coming for dinner. If you discount the cheese, buns and chilli jam, they’re packed full of vitamins and minerals too! The smoky cumin, zingy minced chilli and fresh parsley along with the earthy sweetness of the beets and the nuttiness of the chickpeas gives the sliders a fantastic flavor. Then add in the grilled halloumi, cut thick with a luxurious melted center and crisp, caramelized outside. Topped off by peppery arugula (rocket) and sweet and spicy chilli jam. I find that sometimes eating beets can be a bit like eating mud; if they’re not flavored and/or cooked correctly the earthiness can be a bit overpowering, but not here. This mixture of flavors is a perfect complement to the beets and all in a delightful little package! The recipe calls for raw beetroot, but the veg shop was closed and our supermarket very rarely carries things which would be considered ‘out of the norm’ like raw beetroot, so I used beetroot which had been pickled in malt vinegar. To try and offset the sharpness of the vinegar, I grated it and then rinsed it thoroughly. Then I drained it really well, but because it was already quite wet from the pickling and then from the rinsing, I didn’t bother using an egg and it bound together perfectly without it. The vinegar didn’t come through at all in the final product, so ultimately a success I think! We just ate these with oven fries, but I’m sure you could come up with something fantastic and exciting to serve with them: sweet potato fries, fried or baked zucchini (courgette), or just a shredded vegetable salad or something if you wanted to be ultra healthy. I think these would be excellent just served as a snack or finger food at a party, but they’re probably too hefty for a starter as part of a multi-course meal. No matter how or when you enjoy them, just enjoy them. This recipe might just change your mind about beets! Wine Pairing: Olive recommends enjoying a Viognier with these sliders and having done so, I can highly recommend it! The one we had was Yalumba 2012 Viognier (£9.99) and the fruitiness (mainly apricot) really went well with the sliders. 1. Grate beetroot in a food processor using the grating attachment. If using pickled beetroot, remove from food processor into sieve, rinse well and leave to drain. 2. In bowl of food processor, pulse chickpeas until they form a rough paste. 3. In a large bowl, mix together grated beetroot, chickpeas, cumin, chilli, parsley and breadcrumbs (add egg also if using). Season well and mix until combined. 4. Form into 12 patties, each one should be slightly smaller than your palm. 5. Heat olive oil in a large, shallow frying pan over medium heat. Cook patties for 3-4 minutes each side until crisp and brown. Drain on paper towels if needed. 6. Dry fry halloumi slices until caramelized on both sides. 7. 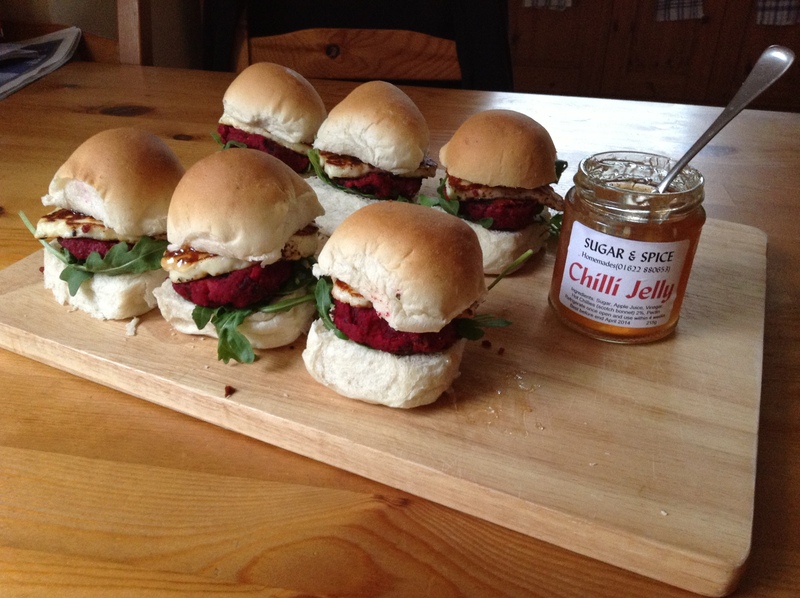 Assemble sliders with rocket, halloumi and chilli jam. Lovely! 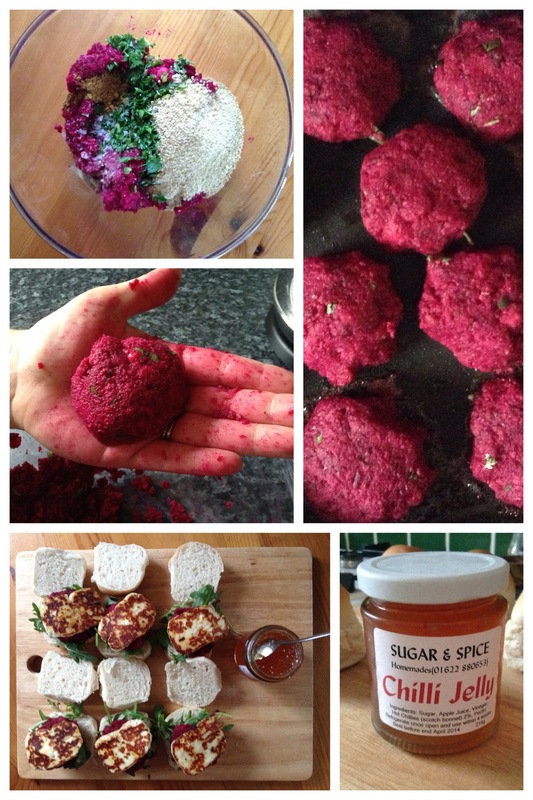 We are eating less and less meat, but we love “burgers”; I have recently been making fava bean burgers, and lentil-chickpea or quinoa-chickpea burgers, but I love this bright pink beetroot version. So pretty and healthful! They were stunning to look at and they taste great too! It’s a win, win! Wow! That is really getting your hands into your work – almost Lady Macbeth. Nice images; interesting recipe. Beets are just coming in around here. It would probably taste quite different using raw beetroot, I’d be interested to know if you try it. Luckily the red came off after I had done the dishes, so no Lady Macbeth here! These look incredible! I can’t wait to try them. WOW! The chili jelly is a nice touch. I’ve never seen it before. Thanks for sharing this. I think it’s quite easy to make yourself and then you can moderate how spicy/sweet it is. It’s really good with cheese and crackers too and my husband likes it on sandwiches! Look at you! Your sliders look absolutely yummy for the tummy! I wonder if I can get Grandma interested in these! She should like them, they’re “good for you”! Although remember halloumi over there costs $10 a block. Feta would be good instead or you can broil them with a slice of mozzarella on top. Oh I have to make these this week for when my daughter comes home. She and I will both love these! Thanks for the great recipe. No problem! Thanks for reading! I hope you enjoy them. What a perfect combination! I will have to give these a try! Brioche buns would make them even more decadent. Let me know how it goes! That looks an amazing snack! Thanks, they were really delicious! Just finished eating these delicious little burgers! LOVED them! (I had to make carrot burgers for P. who hates beets, and he liked them; I tried a bit of his, and found them ok, but not as good or “juicy” as the beet ones). I made minor changes to the recipe, but nothing worth mentioning. Halloumi and chilli jam are two things I don’t have on hand, so I made a tahini-cilantro-yoghurt sauce for the burgers, and it worked quite well too! Will definitely be making these again!! !